The Tickford Mustang Bathurst '77 Special features livery reminiscent of the famous Moffat and Bond Falcon racers. Local Ford performance specialist Tickford is commemorating one of Ford's greatest moments in Australian touring car racing by partnering with Allan Moffat to produce the Tickford Bathurst '77 Special. 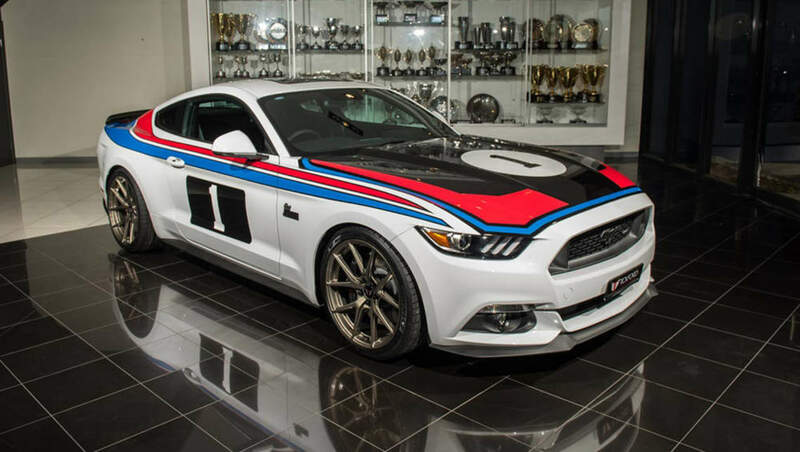 The package is a limited-edition Tickford Mustang GT which pays homage to the Ford Falcon XC Hardtops Moffat and team-mate Colin Bond drove to a controversial 1-2 finish in the 1977 Bathurst 1000. The Tickford Bathurst '77 Special features a range of special components, engineered to provide a unique and individual experience, aimed at celebrating the 40th anniversary of Ford's most famous win at Mount Panorama. No more than 77 of the limited edition Tickford pony cars will be built, each fitted with a numbered build plate. The V8-powered Mustangs will be fitted with a high-performance supercharger, significantly increasing the output of the Mustang's 303kW/525Nm 5.0-litre powerplant. CarsGuide understands that demand for the Moffat Mustang is already high and that many requests for particular build numbers have been received. Tickford is yet to establish whether or how they will be able to fulfil those requests. Externally, the car reflects the 1977 version of the Falcon with a modern interpretation of the livery – all Bathurst '77 Special vehicles will be white, fitted with a full decal kit and replica rear wing. "This year is a significant anniversary in Australian and Ford motorsport history and while it will be celebrated in many ways, we are privileged to be working with Allan Moffat to create a modern V8 hardtop that pays tribute to his famous winning machine," said Tickford CEO Tim Edwards. "We wanted to give fans that either witnessed the famous 1-2 live, or have come to appreciate the supreme effort after the fact, the chance to own a unique vehicle that has been developed in conjunction with the man that made it happen. "The fact Allan endorses the program and has worked with our project team from initial concept stage to provide input into the Mustang's development only adds to its status." Moffat and Bond had dominated the Australian Touring Car Championship that year with a series of 1-2 results against Holden opposition driving the fragile, and by then outdated, Torana L34. Bond settled for second and the highly choreographed and dramatic finish caused a raging controversy amongst fans. The pair, along with their co-drivers, international star Jacky Ickx and local Porsche importer Alan Hamilton, had the Bathurst race shot to pieces when Moffat's car developed problems late in the piece. Ickx drove his stint in Moffat's Falcon like the ex-Formula One and sportscar ace that he was, but while fast, the European's press-on style was soon too much for the brakes on the heavy Falcon Coupe. Moffat was doing a good job stroking the wounded car to the finish despite the ominous black smoke emitting from the Falcon's front wheels, but team-mate Bond's car was still healthy and he was gaining – fast! A huge TV audience across Australia sat glued to Channel 7's still relatively novel colour broadcast of the Great Race as the drama unfolded. Most were unfamiliar with the concept of 'team orders' that permeates professional motorsport and expected Bond to just sweep by as he liked. Many members of the general public were appalled when Moffat's American crew chief Carroll Smith showed Bond a hand-chalked pit board that read 'Form finish 1 – 2' as he entered the final laps. But the professional and loyal team-mate that he was, Bond settled for second and the highly choreographed and dramatic finish caused a raging controversy amongst fans of a scale usually reserved for the bat and ball sports. It was high point of Ford's 'on again – off again' efforts in local car racing and the last of Moffat's four victories in the Bathurst classic. The defeat was seared so deeply into arch-rival Holden that they redoubled their efforts and won six of the next seven James Hardie 1000s. Full vehicle specifications will be listed at a later date but will include a full OEM-spec leather interior with unique Tickford Bathurst '77 Special treatment. Each Tickford Bathurst '77 Special will be fitted with an extensive list of special modifications including performance, interior and exterior enhancements. Full vehicle specifications will be listed at a later date but will include a full OEM-spec leather interior with unique Tickford Bathurst '77 Special treatment, including XC Hardtop red and blue stitching on the seats, a bespoke steering wheel plus unique cabin badging. Tickford's Moffat Mustangs will ride on 20-inch alloy rims, painted in a unique shade of gold in line with the original racecar. "It is hard to believe it has been 40 years since Colin and I finished 1-2 at Bathurst but while I recall the race as if it were yesterday, it is nice to know it holds such a special place with so many people all these years on," Allan Moffat said. "The team at Tickford have done a very thorough job coming up with a modern interpretation of my 1977 XC Hardtop. While the Falcon has sadly been consigned to the history books, the Mustang was always one of my favourite cars to race and I had considerable success in them. Ford have done a great job with the latest one. "The Tickford Bathurst '77 Special looks amazing, produces an unbelievable amount of power and the finish across all areas of the vehicle highlights why the return of Tickford is so important for the Australian automotive industry. These guys know what they are doing and it shows in this special edition," Mr Moffat said. Tickford is seeking expressions of interest for the Tickford Bathurst '77 Special but so far there is no official word on how much extra the Moffat Mustang will cost. Industry sources suggest that the final price will be somewhere in the order of $115,000 to $120,000 given the range of modifications and enhancements fitted to the vehicle. While one of the few options on the special Mustang will be to delete the race numbering which may attract too much attention for some on their daily driver, there is no confirmation whether Tickford will offer a number 2 option for Colin Bond fans or other well-heeled enthusiasts looking to have a full set. Should Colin Bond have driven past Allan Moffat to win the 1977 James Hardie 100 at Bathurst, or was he right to be a loyal team-mate and form finish 1 - 2? Tell us what you think in the comments below.